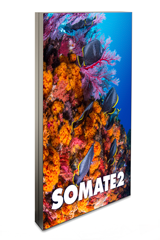 SOMATE can be used unlit or backlit. It is possible to use it as “frontlit” (i.e. the textile is illuminated from the front) or as “backlit” (i-e. the textile is illuminate from behind). The textile structure of the material is barely visible. Due to the close weave it ensures an optimal light scattering. The matte surface minimizes reflections. Because of the special coating adapted for the usage in LFP inkjets, brilliant colors can be produced. Furthermore you receive homogenous print areas and most detailed drawings using eco solvent, latex and UVC based printing technologies. The image can be transferred on the backside with sublimation inks and sublimation paper.